A few months ago, I spoke with the conceptual poet, poetry scholar, and experimental musician Tom Orange about poets who currently live and write in the state of Ohio. Through the course of our discussion, Orange mentioned the little known poet, dramatist, and musician Russell Atkins. Born in Cleveland in 1926, Atkins still resides in the city today. 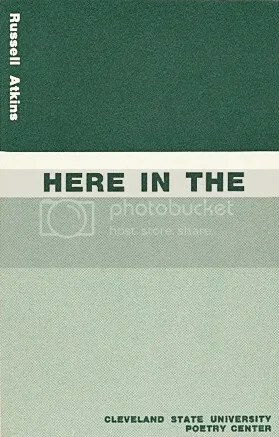 Orange also mentioned that he recently wrote an essay for a forthcoming anthology showcasing the poetry of Atkins. The collection, titled Russell Atkins: On the Life and Work of a 20th Century American Master and edited by Michael Dumanis and Kevin Prufer, will be released later this year on Pleiades Press as part of their Unsung Masters Series. The series puts out one new collection a year that contains work by, and five-to-six essays about, a neglected American poet or fiction writer. In addition to Atkins’ own writing, the book will feature essays by Aldon Nielsen, Tom Orange, Evie Shockley, Sean Singer, and Tyrone Williams. This brief and enigmatic image offers us a vision of moonlight slicing through an abandon school that’s being readied for demolition. The moon transforms into a coroner, the building a body, and the city a morgue. To this extent, Atkins addresses the decay of a once great city and foretells the Rust Belt’s continual decline as a result of the difficult economic effects of moving our country’s manufacturing and industrial jobs overseas. Of course, in these “hideous” and “abject” images, Atkins creates a singular, Cleveland-based beauty in his language and the sounds it produces. Yes, while his content focuses on the death of a city, he enlivens that very same material through his poetic technique. Through an aestheticized vision of Cleveland, then, perhaps writers and artists living here (and other cities along the Great Lakes) can find an answer to the manner in which we engage our troubled city: acknowledging its decline, but doing so in a way that honors its inherent beauty. For more information on Russell Atkins, visit his page at Deep Cleveland or read his work at the Eclipse archive.